The spikes and plates of the Jurassic Stegosaurus may look like armor that could have staved off intrepid predators, but defense most likely was not their main purpose. According to new research, these bony growths on the back and tail were actually meant for species recognition  so that one Stegosaurus could pick its friends out of a crowd. "Paleontologists have been trying to determine what the plates and spikes of stegosaurs were for, for over a century," says Russell Main, lead author of a new study published in Paleobiology this month. "The hypotheses have included defense, thermoregulation and display, either sexual or species recognition," he says. In previous studies, scientists ruled out the defense mechanism as the primary function of the plates (also called scutes) and spikes, as did Main, who is now a graduate student at Harvard University, and his co-authors. Although their fearsome appearance may have played an accessory role in protecting the large herbivores, the researchers determined that the relatively light construction was not robust enough to act as a deterrent to predators, Main says. "We, and the previous study, expected that if these structures had evolved for defense that they would have been built more solidly," he says. "Just because an animal looks like it could do something with its horns or bony dome or plates doesn't mean it did," says Mark Goodwin from the University of California Museum of Paleontology in Berkeley, Calif., who is not affiliated with the study. Ornamentation in dinosaurs is fairly common and many have bony armor, horns and spikes, he says, but that does not necessarily mean that protection was the primary role the armor played in a dinosaur's life. 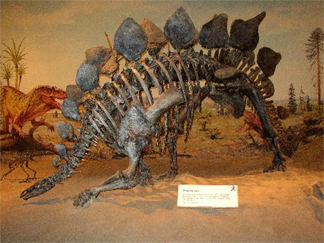 In this museum display of a Stegosaurus, the plates, or "scutes," are apparent on the dinosaur's back, although the tail spikes cannot be seen. Image courtesy of Earth Science World Image Bank; Abi Howe, American Geological Institute. Another school of thought argued that the plates and spikes existed for thermoregulatory function  to maintain a stegosaur's internal body temperature. Until now, this has been the most widely accepted explanation, Main says, for two reasons: The outer surface of the plates was covered in a large number of blood vessels, and in thin section, "pipes" or open circular spaces were apparent. If connected to the vascular network outside of the scutes, the pipes could conduct blood to be cooled or heated by the environment. But the connection between the two could not be determined based on a single plate that was examined previously. To find the connection between the vessels and the pipes, Main and his colleagues studied not only the structures of stegosaurs, but also of related armored species including their primitive ancestor, the Scutellosaurus, the younger Scelidosaurus and the ankylosaurs, a sister group of the stegosaurs. They made thin sections of the scutes and spikes from several specimens donated by museums. 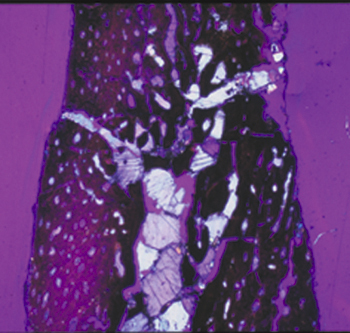 This transverse cross section of a Stegosaurus plate, partially crushed during fossilization due to its lightweight construction, reveals vascular canals in the outer bone (red/purple). The inner support structure of the plate is now filled in with a rock matrix (white). Image courtesy of Russell P. Main. The team thus concluded instead that the spikes and plates were for species recognition. And the same holds true for the other groups studied, Main says. "There was a good diversity of stegosaurs in China and also six stegosaur taxa known from the North American Jurassic Morrison Formation," he says, "so it seems that for stegosaurs you did have a number of different species in the same areas, for which it would have been useful to be able to tell one another apart." Several different dinosaurs, including ceratopsians (like the Triceratops) and hadrosaurs (duck-billed dinosaurs) show elaborate crests, horns, spikes, scutes and other "frills." What many of them have in common, Main says, is that there were many species of each group that all looked quite similar, apart from their adornments. "Perhaps what our study shows best is that these bizarre structures' purpose may be just that: to be bizarre, to differentiate one group of animals from another," he says. 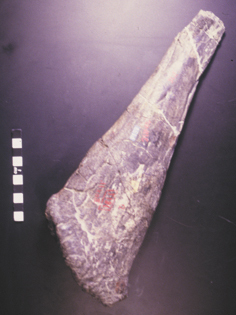 The tip of this Stegosaurus spike (top right corner) broke off, either while the dinosaur was alive or during the fossilization process. Paleontologists now think that spikes and other adornments may have existed for species recognition. Image courtesy of Russell P. Main. Still, the plates certainly may have played some accessory part in thermoregulation, as well as for a defensive function, Goodwin says. Structures may have more than one function, he says, or the function may have changed over time, during an individual's lifespan or evolutionarily. "It's not necessarily an either/or question," Goodwin says. "There is evidence that both goats and reindeer can shed heat through their horns and growing antlers, respectively," Main says, "but nobody would argue that shedding heat is the primary purpose of these structures. We argue the same for stegosaurs."